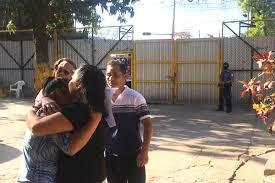 Evelyn Hernández Cruz, inside the gates of the Ilopango Women’s Prison in El Salvador on Friday, hugging her mother while her father looks on. Evelyn Hernández Cruz, 21, was released from the Ilopango Women’s Prison in El Salvador on Friday after 33 months of incarceration for charges of aggravated homicide after she experienced an obstetric emergency in April 2016 during which her baby died. She still faces a re-trial on April 4 of this year on the same charges, but she was granted release under alternative measures to imprisonment as she awaits retrial. The Agrupacion Ciudadana por la Despenalización del Aborto, or Citizen Group for the Decriminalization of Abortion, in El Salvador has supported her throughout her ordeal and has maintained that she was unjustly accused and convicted. Twenty-two other women remain incarcerated on similar charges related to the country’s absolute ban on abortion. Hernández’ legal team appealed the original conviction from July 5, 2017, as reported by Rewire.News, but it was upheld in August 2017. Upon appeal to the Criminal Court of the Supreme Court of Justice, that court annulled the original conviction on September 26, 2018, on the grounds that there was not sufficient evidence to justify the conviction. The evidence submitted in the original trial demonstrated that her baby died from meconium aspiration, which occurs when a newborn or fetus aspirates its first feces produced before birth. This can take place before, during, or after birth, and is not a process that the pregnant person can control. After annulling the decision, the Supreme Court remanded the case to the trial court, which ruled in December 2018 that a new trial must be held, but specified that a different judge must hear the case. But Hernández remained incarcerated, which violated Salvadoran law that prohibits holding an accused person more than 24 months in prison without a final resolution to a case. In the Court’s decision, which Rewire.News has reviewed, attorney Bertha De Leon argued that Hernández’ right to the presumption of innocence and her right to liberty were violated by her continuing incarceration. De Leon requested that Hernández be released on alternative measures while awaiting her new trial. De Leon’s request was granted on February 14, and Hernández was released on February 15. Under the alternative measures, she is required to maintain the same residence, stay in the country, and be present for her new trial scheduled for April 4. The Agrupacion contends that Hernández’ case is part of a pattern in which young women, living in marginalized conditions and lacking access to adequate health care and sexual education, are criminalized by state institutions when they arrive seeking emergency medical care at public hospitals after experiencing obstetric emergencies. The organization continues to fight to free the other 22 women currently imprisoned with similar cases. There are huge benefits from this decision from the High Court that can help other women in similar cases. They are listening to the legal argument that women are being accused of serious crimes under circumstances that are very unclear. They acknowledge that for Evelyn, and indirectly other women, too, it is extremely difficult to show that there was an intention to do harm on the part of the woman. This decision also shows that there are some changes in the judicial system. Until recently it was just a given that all these women were bad people. Now there is a window of doubt on that view. It’s a sign that Salvadoran society is changing. Even a year ago one of the major newspapers was publishing terrible stories about Evelyn, pages of horrendous accusations. Now, stories leave open the possibility that women like Evelyn could be innocent. The downside to the decision was that the court could have absolved her at that point, and they didn’t. Now she still has the uncertainty of the April 4 trial. Moisa explained how the law hasn’t always been this way. “Only when the law changed in 1997,” when the legislature reformed the law to prohibit all abortions, “did we start to see normal occurrences as crimes,” she said. “In 2019 we shouldn’t be fighting for the presumption of innocence when a woman loses a pregnancy. We shouldn’t have to be proving that motherhood is not related to crime. We should have full human rights as Salvadoran women,” said Moisa.